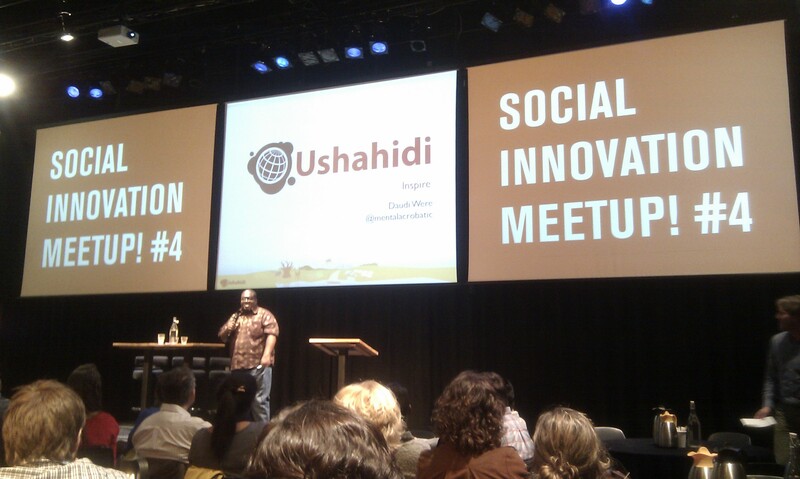 On April 25, Social Innovation Meetup #4, organized by Hivos and Kennisland, was held in Amsterdam. Theme: “Exploring Labs for Social Change”. Social innovation labs are very popular as instruments for “changing the system”. However, what actually happens in these labs? How do they help accomplish social change? What’s in “the black box”? Keynote speakers sharing innovation stories from Kenya, Finland, and Canada were Daudi Were of Ushahidi, Marco Steinberg of the Helsinki Design Lab and Vanessa Timmer of One Earth. In the two days prior to the meetup, representatives of living labs (hubs, experimental learning spaces, etc.) from all over the world gathered in “Lab2“. Together, these people in the vanguard explored new examples and solutions for system change, some of which were reported at the meetup. There was also supposed to be a panel discussion to see how their lessons learnt might apply to the Dutch context, but unfortunately that part was cancelled. The presentations were brief and intense, relaying a flurry of interesting ideas and references. Like at the “Designing Social Cities of Tomorrow” workshop last year, I took presentation notes. They are rough, and only minimally edited, although I have added some links and excerpts from the sites linked to. Together, I think these notes give a nice overview of the many dimensions experienced at the international front lines of real social innovation. A brief introductory speech was given by Remco Berkhout of Hivos. There are many tough global problems, like climate change, for which there are no clearcut solutions. Hivos believes that citizen action is key to addressing these problems. People from all over the world are involved in such processes of social innovation. There are many interpretations of what is social innnovation: any idea that makes the world better, creativity of communities to make things better, popukar participation, with resources going to the communities, and so on. The silos need to go. Cities in the south can be great sources of inspiration. Given the pressing problems, labs there are often much more advanced than here in the West! In 2007, all hell broke loose after the Kenyan elections, resulting in many riots and murders. Many stories were un(der)reported. We needed to find stories of what was happening, curate them, map them, and archive them. Ushahidi was born, very quickly, in a couple of days. Ushahidi means “witness” or “testimony”. It really is a platform + community + movement. The basic idea: from people in need to people who help. Does it work? Yes, it’s use has spread way beyond Kenya, e.g. during the Haiti earthquake and the Japanese tsunami the platform was used as an emergency platform. By now, it has got many other uses, including mapping harassments, oil spills, social revolutions (Arab Spring, Occupy), and monitoring elections (Tanzania and Zambia), mapping the different reasons why people voted in the Canadian elections, and so on. It is changing the way info flows in the world. How? We meet you where you are (in creating a great diversity of interfaces for sending to and receiving info from the platform). Both high-end applications (for decision makers) and low-end applications (to reach the masses) are important. In an emergency, you can have it set up in only a few minutes (via crowdmap.com). It’s “Made in Africa”: “if it works here, it will work anywhere in the world :-)”. We created iHub. Nairobi’s Innovation Hub for the technology community is an open space for the technologists, investors, tech companies and hackers in the area. This space is a tech community facility with a focus on young entrepreneurs, web and mobile phone programmers, designers and researchers. It is a place to physically meet, partner up, share ideas, get exposure and support. We have over 9,000 members. It’s much more than just another cybercafe: over 40 companies have come out of it in the past few years. We also have a number of initiatives designed to build an ecosystem around the Kenyan tech entrepreneur: Hub Research, iHub Consulting, iHub Supercomputing Cluster, and the iHub User Experience (UX) Lab. iHubs are started all over the country. Focus on people, not spaces. Promote restlessness, not scariness.Scary would be if everybody thinks the same thing. Instead, people should be itchy in their seats, get started doing things, like setting up companies. Get them thinking, innovating and doing. Start with what you have. Every starting group has some resources, trust, whatever. Don’t wait for money, stable energy supply etc. before you get going! What to do if you’re faster than the rest? “If you want to go quickly, walk alone, if you want to go far, join others”. Find people who want to go at a similar speed. Social change really takes time, but the problems don’t allow time. As Ushahidi shows, sometimes things CAN move quickly when they have to. The elections in South Sudan showed that you can have a mapping project even though there’s a situation of high conflict and low resources. Most important are the partnerships, technology is only 10%: outreach, training, credibility are what really matters. We’re beyond just the technology, our priorities now are conversations about strategies and methodologies. In crisis situations there’s often an information overload, or “filter failure”. The Swiftriver platform helps people to make sense of a lot of information in a short amount of time by filtering and verifying real-time data from many different channels like Twitter, SMS, e-mail, and RSS feeds. We’re trying to innovate within a “dominant culture”. We can no longer understand our society, are enabled and at the same time imprisoned. How do we change values, etc. when we’re in bureaucratic organizations that don’t want to change? Sitra, the Finnish Innovation Fund, has an endowment to innovate government. It focuses on “strategic design“: “Our idea is to shift it right to the beginning of the process. Our concept of design is much broader too, and we want to apply our expertise across traditional boundaries to problems of health care, transport and the ageing population, for example.” One of Sitra’s activities is the Helsinki Design Lab. The Helsinki Design Lab aims to bring innovators together, provide a community development platform, codify practices, do experiments, etc. One output is Brickstarter, which “is about 21st century social services. We are sketching a system that would enable everyday people, using everyday technology and culture, to articulate and progress sustainable ideas about their community”. Another initiative are their Helsinki Design Lab Studios. There are many, large, interconnected crises. We are aware of many of the issues, but don’t know how to think about them. We need different perspectives and logics. Politicians create visions, while technicians and experts help realize the visions. Many of their ideas are fundamentally flawed. For example, at the beginning of the financial crisis, President Bush gave shape to decisions about problems he didn’t understand. Chairman of the Federal Reserve Alan Greenspan had relied on financial data and models for over 40 years, only to then have to admit how flawed these constructs from “the dominant culture” were. The mission of innovation has gone from “things” to “systems”, like health and the environment. However, we (as government) are not set up to deal with this. We need to understand the interconnected nature – the “architecture” – of issues, solutions, and decisions. Innovations begin by asking the right questions. Strategic design is just as much about the problem as about the solution space. If only focusing on problem space, we stay in the abstract, if only dealing with the solution space we risk optimizing bad designs. Interconnectedness is key, however, disciplines and bureaucracies like ministries have “anti-interconnectedness” mechanisms. It’s not really a purely technical, but a deeply cultural problem, sometimes even requiring the rediscovering of practices lost. A Helsinki Design Lab Studio provides an environment for people to think differently from the dominant culture. How do we speed up innovation? We start with an in-depth brief. We bring in eight people for “deep collaboration”. We use a “Noah’s Ark” approach: you can’t talk to everybody. We choose experts that provide the critical eight perspectives. Six of them are foreigners, so that they will touch taboos and bring in different frameworks. Two designers help bring about synthesis. What are the Top 10 things to do NOW? A session lasts a week, with day 2 being a field day, and at the end of the week a review session with policy people, concluded by an informal dinner. This way, government officials get a “strategic conversation”, instead of the usual report tomes. Afterwards, the results need to be shared with people in other forums, through publications, etc. Integrated approaches are key, and an HDL Studio is a good way to start. How to deliver this? It should happen from within government, which can then use its muscle to move quickly. However, is it big and fast enough? Doesn’t this lead to overly prescriptive/constrained approaches? We need to codify the right things: the preconditions for making the studio process work. Bill Rees has shown that our ecological footprint is key. Instead of looking at symptoms, we need to look at the system as a whole, working better together at understanding and changing production and consumption patterns. We need new mapping tools, be smarter, not just work harder, in order to release new energy. We’re working on a “systemic change initiative”. The RE-AMP Midwest Energy network was the inspiration. This is an active network of nearly 160 nonprofits and foundations across eight Midwestern states working on climate change and energy policy with the goal of reducing global warming pollution economy-wide 80% by 2050. It uses systems mapping to decide where to put their energy in, and has scored lots of successes. Interesting related things happening in North America are the Stanford Social Innovation Review, the Academy for Systemic Change, the Change Lab, and the Sustainable Food Lab. Social innovation is to experiment with new ways of seeing the world, new relationships, power dynamics and practices. We need new spaces: visible spaces, conversation spaces, temporal spaces (sequences of events over time), laying the ground for new relationships and actions. When prototyping, do at least 3/4 pilots. This keeps the motivation to keep exploring when one pilot fails. Two types of scaling: scaling out (replicating) and scaling up (reaching different levels of systems or policies). Scaling out requires a different skill set from scaling up. Scaling out is about taking the essence and bringing it out to the broader community. Scaling up is about dealing with vested interests, making new connections, new things possible at a higher level. Keep your models light, don’t get stuck in models and processes and make them too solid over time. The reality is messy, be flexible and adaptive. Use 3/4 people when modeling, with more it becomes messy. In the implementation stage, many people get lost in the details, keep getting them back to “the dream”. “Dance with the system” when facilitating social innovation. thanks for sharing! an impressive summary.